Happy Thanksgiving to all you American's out there celebrating! I hope you're with your loved ones burrowed inside enjoying yourselves and staying warm. Although Canadian Turkey Day has passed, I felt that dressing in the holiday spirit was still fitting! 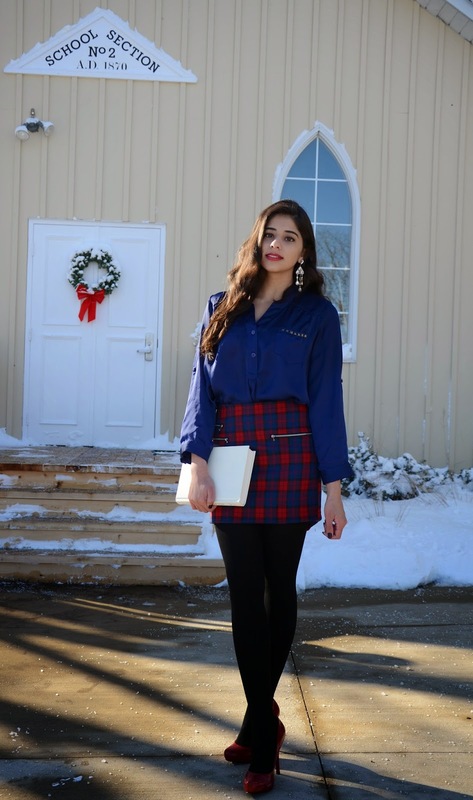 As you can probably tell from previous posts, I'm lovin' the tartan trend this Fall. Statement earrings are essential for dressing up holiday outfits. I picked up these crystal chandeliers from H&M. Wearing skirts with these chills just doesn't happen without tights. I simply throw on my opaque black tights from H&M to keep warm and add class to an outfit. Hi! your look ise awesome: this color combination is my favourite...and wow snow everywhere! Adorable outfit! I love how you grounded the look with black tights for winter. LOVE this look! Makes me need more tartan in my life.